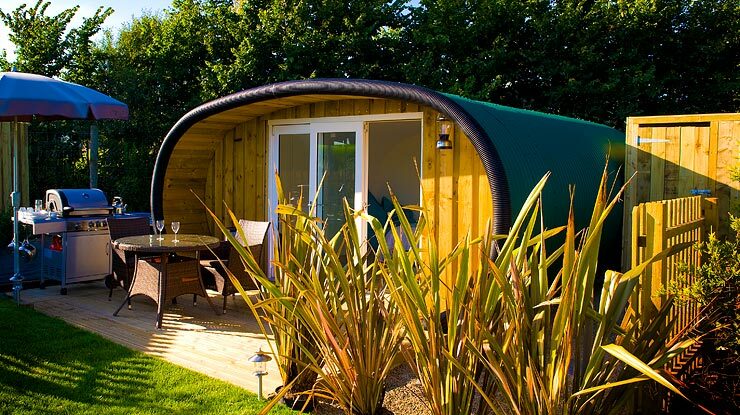 Why rough it when you can go glamping? Glamping is the stylish, elegant way to go camping in ultimate luxury. Tents are spacious affairs with high roofs, proper sumptuous beds, large wardrobes, relaxing armchairs and all the comfort of home. 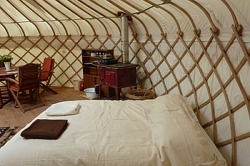 Many glamping sites have large yurts in which to sleep, these lattice frames are covered in canvas and have been provided accommodation for nomadic tribes of Central Asia for centuries. Other camping options include well kitted out, old-fashioned bell tents as traditionally used by the army of yesteryear, tepee constructions or ultra-modern pods. Glamping accommodations also tend to have an independent power supply, carpeted flooring and come complete with wall hangings and pictures to complete the homely feel. Mongolian yurt comfort in the Cornish countryside, each tent comes with its own sturdy beds, log burning stoves and internal furnishings. They all have their own wooden decking porch, so no muddy feet problems and a sheltered outdoor cooking area. The nearby village of East Thorne has a supermarket, two pubs and a Chinese, so everything you need is close at hand. Another yurt resort on an organic farm just on the outskirts of Forest Row in Sussex. This site is situated in an area of outstanding beauty on the edge of the Weir Wood Reservoir and Ashdown Forest. The six-berth yurt comes with a comfy sofa bed and inflatable beds for additional people, fully functioning kitchen and electricity supply. 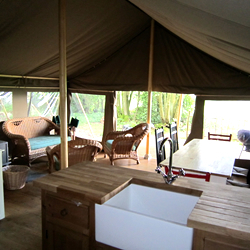 Take a holiday in safari style in the Hampshire countryside on the Bereleigh Estate. These canvas lodges have their own cane furniture, quality beds and wooden decks on which to relax. They have their own showers, flushing toilets and functioning sinks, set in 350 acres of splendid woodland of the South Downs National Park. This small 10-acre site has three yurts each with a modern kitchen, private porch, toilet and shower. The site makes for a great base from where you can discover the gorgeous Powys countryside without the hassle of erecting a tent. High quality glamping on the Isle of White, each tent comes kitted out with strong wooden beds, cupboards and natural floorings and rugs. You can order supplies of fresh organic food and relax in the orchard at the café. At Freshwater Bay you can have a totally green holiday experience, with the owners encouraging visitors to leave their cars at home. The pods come with king size beds, foam mattresses and cotton sheets, solar lighting, kitchen area, BBQ, private shower and flushing toilet. This is all set in 26 acres of marvellous Cornwall, with plenty of places to visit within easy reach, alternatively just relax on your own sun deck and unwind. This entry was posted in Holiday and tagged camping, eco holiday, glamour camping, Glamping, luxury camping, rustic. Bookmark the permalink.